While Facebook is moving away from displaying news on the user’s News Feed to provide a more personalized experience, Twitter is going in the opposite direction and embracing its role as a media and news outlet. The social media platform recently debuted a new feature which shows a live news broadcast in a window next to the timeline. The live stream only appears during major breaking news events and aims to provide contextual information about whatever is trending. In order to provide the live stream, Twitter will rely on partnerships with local news station for the footage. The new initiative was recently put into action while streaming footage from Miami’s WSVN 7 channel, which covered the shooting at Broward County’s Marjory Stoneman Douglas High School in Florida. “We’re continuing to work on new ways we can surface credible and relevant information to help people stay informed. By pairing live video with the conversation on Twitter, there is no faster way to see what’s happening in the world”. Upon clicking on the live stream, users are redirected to a custom timeline with automatically curated tweets about the news event. Twitter claims that airing live streams greatly increases the number of conversations regarding the news on the platform. Although algorithms used for curating tweets may be vulnerable to exploitation and promotion of misinformation, pairing them with selected tweets from reliable news sources might help mitigate the issue. 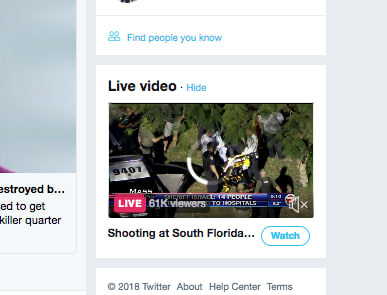 Buzzfeed News reports that Twitter’s broadcast about the Florida school shooting was “clearly of interest to a decent number of people using Twitter” as it registered over 50,000 concurrent viewers at one point.